*I dug into the back of the closet and dusted off this one from December, 2010. Hope you don’t mind a rerun. Lynn, we are ‘neighbors’ at Tell His Story this week….I’m so glad I stopped by. I liked this juxtaposition of all the ways we can come near to God–in sorrow and joy, in emergency and stillness. Beautiful! Beautiful, sweet friend! I used to think that when I missed it, I couldn’t draw near till I cleaned myself up. I’m learning he wants me to draw near even when I’ve misplaced my grace – and then he gives it back to me! Wishing you God’s Shalom during this season, Lynn! This painting of the kneeling Mary is lovely, and the text too. Merry Christmas Lynn. This year has been a drawing near for me, hearing the voice of God call me to repentance. Thankful for His grace which allowed me to draw near, as I learn to walk by faith. Thankful for family, friends and new friends (I’ve met in this forum) who each day live Christ-centered, passionate lives; serving as examples genuine biblical Christianity. Thank you Lynn for extending encouragement, friendship and fellowship. Merry Christmas and may God bless you as you have so wonderfully blessed me. Amen! Have a blessed and peaceful Christmas Lynn. Merry Christmas, Lynnie! God Bless you and your wonderful family! Terra, I’m always so happy to see you here. Thank you so much for commenting. May you have a very blessed Christmas! MTJ, It has been my pleasure to have met you this year. Thank you for your friendship. And thank you for your dear comment. May you have a very blessed Christmas! Hey, dear Lynnda! You have blessed me! Thank you for your friendship. 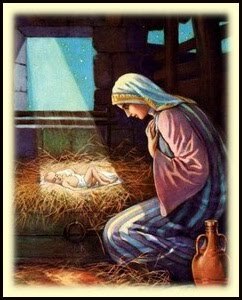 May you have a very blessed Christmas! Nicky, thank you so much for taking time to drop by for a visit and leave a comment. Makes my heart happy! Hope you have a very blessed Christmas! Hey, my sweet Merry Merry! Thanks so much for the Christmas wishes. I pray you have a Merry Merry Christmas, filled with blessings! Beautiful–and so needed. We often forget at this time of year the baby came to die for our sins. Who would leave heaven and enter into the form of a baby, endure the cruel hardships of this world, and then die upon the cross for such sinful people as we? The only ONE! Thank you for this reminder to “draw near.” In the rush of Christmas ~ and this has been a crazy year for us with many unexpected circumstances and adaptations ~ I needed to hear this today. Blessings to you this Christmas season, Lynn. Simply humbling and beautiful, Lynn! Praise GOD!